Milan (AFP) – Last-gasp goals from Arkadiusz Milik and Amadou Diawara kept Napoli’s title ambitions alive with a 2-1 win over Chievo on Sunday to maintain pressure on Serie A champions Juventus. Maurizio Sarri’s title-chasers looked destined to remain seven-points behind the reigning champions as they trailed until the 89th minute in their San Paolo Stadium. Polish striker Mariusz Stepinski’s goal on 73 minutes had put the relegation battlers from Verona ahead, with Chievo goalkeeper Stefano Sorrentino making a string of saves including a Dries Mertens penalty. But Milik headed in the equaliser with one minute to go with Guinean midfielder Diawara grabbing the winner four minutes later deep into injury time. Juventus’s 4-2 win over Benevento Saturday had opened up a seven-point advantage as the Turin giants chase a seventh straight title. But the gap is now back to four points as Napoli continue to push for a first Scudetto since 1990. Juventus have 81 points from 31 games with Napoli on 77 with just seven games left this season. 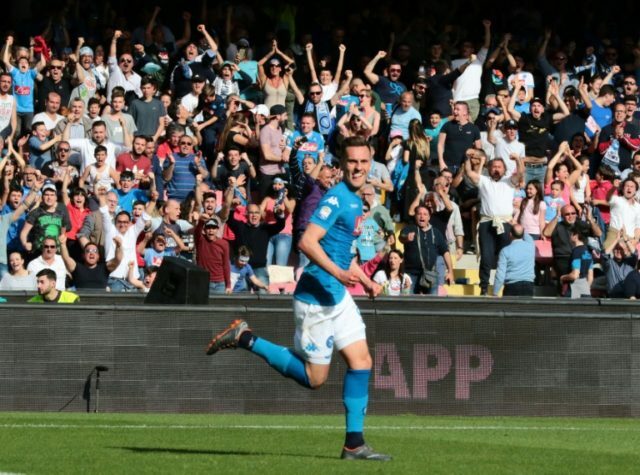 Despite dominating Napoli had little to show for their efforts with Stepinski breaking through on Chievo’s first real chance after sloppy defending by the hosts. A Lorenzo Tonelli header rattled the crossbar minutes later, with Sorrentino clearing a curling Insigne goal-bound shot and Mertens and Piotr Zielinski also hitting wide. But in the final minute with the whistles of the home crowd growing louder, Insigne crossed for Milik with Diawara ensuring Napoli keep pace with Juventus with the two sides going head to head in Turin on April 22. Earlier Adem Ljajic scored the only goal for Torino to ensure former club Inter Milan missed the chance to move third. Inter could have overtaken AS Roma after the side from the capital lost 2-0 at home against Fiorentina on Saturday. But Luciano Spalletti’s side now risk dropping out of the Champions League places with Lazio — two points behind in fifth — travelling to Udinese later on Sunday. It was the first time that Torino coach Walter Mazzarri had faced his former club Inter since being fired in November 2014. Pushing for Europa League football next season Torino are six points off the sixth position held by AC Milan who host Sassuolo later on Sunday. “There are moments when it doesn’t go your way, no matter how you try, even if you push the ball,” said Spalletti, whose side were held to a goalless draw by AC Milan midweek. Sirigu cleared early efforts from Antonio Candreva and Inter captain Mauro Icardi as the visitors threatened early. Torino got the breakthrough with defender Lorenzo De Silvestri setting up Ljajic for the winner with their shot on goal after 36 minutes. Sirigu again fingertipped a Icardi volley out, and kept out a Candreva effort following an Icardi assist, with the visitors also hitting the woodwork twice before falling to a fourth defeat this season.